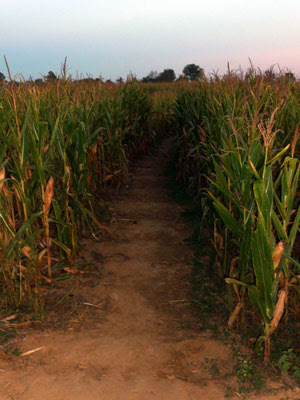 Thursday we decided to make our annual trip to the corn maze in Corryton, TN at Oakes Farm. This has been a tradition of ours for the last 5 years. 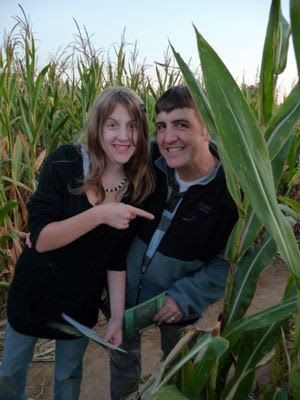 Every year before Halloween, we make the journey to Oakes Farm to find our way through the corn maze and to take a hay ride to their pumpkin patch to pick out a pumpkin or three. Each year the maze is a different design. In the maze there are numbered posts with a hole punch. Before entering the maze they give you a map card with numbers on it that you must punch out with the hole punches at each of the posts. Once you've completed the maze with the correct punches, you can submit your card for a prize drawing. Well we've never submitted our card, it's prize enough to know that we can read a map and make it through the maze in the dark. Their is more there than just the maze and the hay ride. They also have a maze that is haunted. In years past, they only had the one maze and on certain nights it was a haunted maze. The first time we went it was haunted. Let's just say that we've made sure to go on un-haunted evenings since. Now they have a separate maze that is haunted so when you go you can choose either the non-haunted or the haunted or, if you can afford it, both. Well this year we went and were able to make it through the maze again with out getting lost, and collect all the punches. 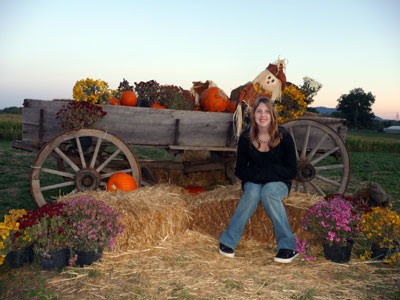 We decided however not to take the hay ride and opted instead to buy pumpkins that they had out front the barn. We had a really good time and got one nice big pumpkin and one warty pumpkin that we thought would be really cool once carved. 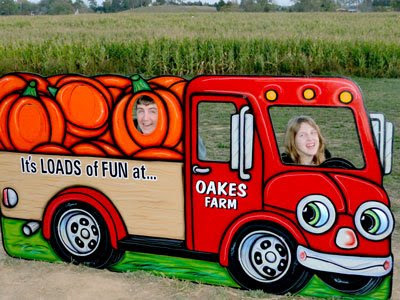 So if you ever find yourself in the area during the Fall season and like mazes, be sure to take a trip out to Oakes Farm and go through the corn maze. And now for the pictures. Enjoy! Want More Appalachia & Beyond? DISCLOSURE: Appalachia & Beyond on occasion host “sponsored posts.” The companies that sponsor these posts compensate us via a cash payment, gift, or something else of value to host it. Additionally the blog contains affiliate links for products that we use and/or review. If you purchase those items through our links, we will earn a small commission. You will not pay more when buying a product through such link. On the upside, when you purchase through our links, it allows us to continue to write this blog and pay for the, albeit small, yearly expenses involved in keeping the blog live. Thank you, in advance for your support!